Shulie Madnick, a renaissance woman with talents in writing, photography, cooking, teaching and public speaking, has spent the last 10 years sharing the stories of the Indian Jewish community through her blog, Food Wanderings. The online project was a way for her to embrace and further explore her Indian Jewish roots through cooking traditional Indian foods, something that she had rejected years before as an act of rebellion against a tradition that expects women to assume the role of domestic goddess. Madnick has built her career in writing and photography by telling the stories of the Bnei Israel Jewish Indian community in dozens of publications, including The Washington Post, focusing on religious rituals and Jewish-Indian food memories and anecdotes. Her parents, Jacob and Dinah, moved from Mumbai to Israel separately in the 1960s along with many others like them, settling and meeting each other in the southern coastal city of Ashdod, home to many Jews from India. Madnick grew up in Ashdod, but moved to the United States over three decades ago; she currently resides in Washington, D.C. The distance doesn’t keep her away from her homeland for frequent visits, however. Her son is a lone soldier in the Israel Defense Forces, and her entire family remains in the Jewish state. If nothing else, she comes to stock her son’s freezer with traditional Indian dishes such as channa masala (chickpeas and potatoes) and red lentil daal (thick spiced lentils served over rice) to enjoy over Shabbat breaks. “It is typical for me to land on a Friday morning, immediately hit the market, then cook a Friday night dinner for my son and 10 of his friends,” she admits with motherly pride. While in Israel, she makes a point to buy the Indian spices she prefers to use from her family’s Indian spice shop in Ashdod, which has existed in the old “District B” fruits and vegetable market for 40 years. “The spices in America are just not the same, nothing comes close to the ones you can find in Israel,” says Madnick, referring to the precise masala blends she uses to make curry. The exception, she says, are spices she found on a trip to Mumbai a few years ago, when she visited a shop in the Lalbaug Spice Market—an establishment her family once frequented before making aliya. Jewish cuisine in Mumbai—typically kosher versions of local Indian dishes—has remained hidden within the city’s Jewish neighborhood and the small villages along the Konkan coast, from which most Bene Israel originated before moving to the Mumbai. 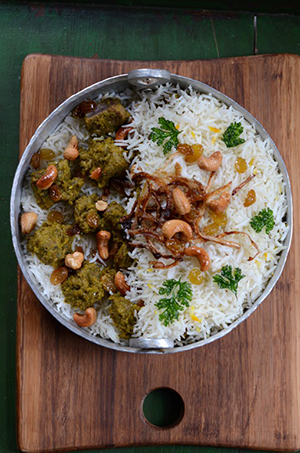 For Madnick and many Indian Jews, the main dish at the Passover seder is lamb biryani. But after so many years in America, married to husband Jonathan, who comes from an Ashkenazi background, Madnick has incorporated classic matzah ball soup into her holiday menu. Now, when she flies into Israel for the Passover seder, she makes the soup using a clear and rich consommé to accompany her Indian entrees, Israeli salads and side dishes of Yemen and Moroccan origin. This slow-cooked lamb biryani—a highly aromatic rice pilaf—as well as a recipe for coconut milk and rice flour crepes are treasured recipes from Madnick’s collection. Note: Sephardi and Mizrahi Jews traditionally eat kitniyot on Pesach, making rice, legumes and similar foods kosher for Passover. If you do not consume rice on Passover, consider making these dishes before or after the holiday, to mark another special occasion or accommodate gluten-free friends and family. Biryani is originally Persian, and was brought by the Arabs and Mongols to India. Over the centuries, the native Indian communities adopted the dish and made it their own. Although ghee, or clarified butter, and yogurt are often used in the dish, Indian Jews replaced those dairy ingredients with vegetable oil to create a kosher rendition. Some of the preparations for this dish can be made a couple of days in advance, with the whole dish fully assembled a day or two ahead. It seasons well over time. It can also be served deconstructed, though it’s best when preassembled, so that the flavors are allowed to marry. A note from Madnick: This recipe is long, but the steps are not particularly difficult. Take it piece by piece so it doesn’t overwhelm you and you will be rewarded for your effort. If you don’t have a rice cooker, begin by rinsing and draining rice. In a pan, heat up two tablespoons oil on medium heat, add the rice and lightly fry. Mix gently. Add salt, a few strands of saffron and water. Bring to a boil, mix and immediately turn down heat to the lowest stove top setting. Cover with a lid and let water completely absorb. Turn off stove and let rice sit with lid on for at least 20 minutes. Gently fluff the rice with a fork to separate the grains. You can make the rice a day ahead and reheat in a microwave or oven. Preferably, cook lamb in a pressure cooker according to manufacturer’s directions with salt, bay leaves, allspice and water. Alternatively, bring lamb and water to a boil on the stove top in a large pot with salt, bay leaves and allspice then immediately turn down to a low-medium simmer. Skim the foam. Half-cover with a lid and let cook for about 1 1⁄2 hours, or until lamb is tender and falls apart at the touch of a fork. The meat will be fairly pink inside. Drain liquid just before adding the masala below. In a pot on the stove top, add the oil and onions and caramelize onions over medium heat until deep gold, stirring occasionally. While onions are caramelizing, put the garlic, ginger, cilantro and chili pepper into a food processor and pulse to superfine consistency. Scrape the sides of and whiz again. Once the onions have caramelized, add the green mixture and cook on medium heat for a few minutes, stirring occasionally. Mix in the salt, turmeric, garam masala and curry powder. Cook for a few minutes longer and turn off the heat. Add approximately half of the masala and all the drained lamb to a pan on the stove top. Cook for a few minutes over medium heat, stirring the whole time. Add more masala if needed. You can reserve the remaining masala for vegetables and other dishes (will keep up to a week in fridge). Heat 2 or more tablespoons of oil on medium heat and fry the onions until they turn a deep brown color and become crunchy. Scoop with a slotted spatula onto a plate lined with paper towels. This step should be done on the day you’re eating. As an alternative, you could use crunchy onions (like French’s, which are kosher but not for Passover) from the supermarket. In same oil you fried the onions, plump the raisins. It takes a minute or less. If you ended up buying French’s onions, then use only 1–2 tablespoons of canola oil to plump the raisins on medium heat. Use 1⁄2 cup raisins if using only as a garnish; add more, according to taste, if you wish to fold raisins into the rice dish. Toss the cashews into a pan with oil heated on a medium flame until they turn golden. This process is very quick. If you wish to fill the biryani with cashews, use 1 cup. If using only as a garnish, use 1⁄4 cup. Or you can buy roasted cashews. If you choose to use cashews and raisins as part of the layers, sprinkle some on top of the lamb. Top the lamb with a layer of rice and repeat the steps. The top layer should be rice, garnished with the crispy onions, raisins, cashews and cilantro chips. The garnishes should be added just before serving. The dish can be made ahead and kept refrigerated. Reheat by covering with foil and baking in a preheated 350-degree oven for 20 to 30 minutes or until it is hot. It is sublime the day it is prepared or a day or two later. One of my more recent discoveries was this gluten free and—as in my adaptation—dairy free crepe the Bene Israel prepare for dinner during Hol HaMoed (Passover mid-week). This little gem of information was shared by my friend Shayela Cowen, a Bene Israeli now living in Australia. 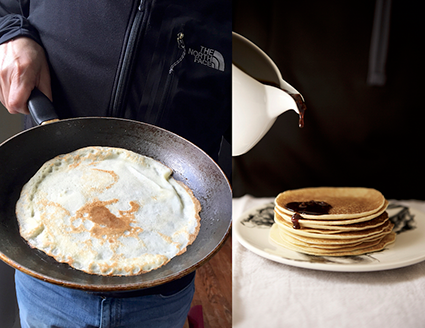 These pancakes are traditionally served with silan date syrup. Heat a 10-inch nonstick skillet on low/medium heat. In a large bowl, whisk together all the ingredients for a few seconds until fully incorporated and smooth, but don’t overmix. Ladle 1/4 cup batter into the skillet and swirl it. Cover with a lid and let cook for 2-3 minutes. You might need to toss away the first few pancakes.